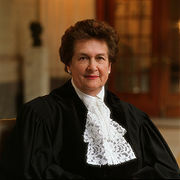 ... 2006 (5 years ago today), Rosalyn Higgins was elected President of the International Court of Justice, a position she would hold until her retirement in 2009. Professor of International Law at the University of London before joining the ICJ in 1995, Higgins (left) was then the only woman ever to have served on that international bench (last autumn, as we then posted, 2 women were sworn in). In 2009, she was appointed the international law adviser to an official inquiry into British involvement in Iraq.